The Daily Telegraph reported that researchers at Bristol University found that a molecule involved in the sensation of pain is released from nerves in the heart during a heart attack. Called Substance P, it draws stem cells from the bone marrow to the area of heart muscle that has been starved of oxygen by the attack. Once there, the stem cells can create new blood vessels to supply fresh blood to the heart cells. Prof Paolo Madeddu, chairman of experimental cardiovascular medicine at Bristol University, led the study. Prof Jeremy Pearson, associate medical director of the British Heart Foundation, which co-funded the study, said: “This is a key finding. Other studies have indicated that morphine is associated with higher mortality in patients with acute coronary symptoms. This study provides further evidence that giving morphine to patients could have side effects and means we are going to think very carefully about its use in heart attack cases. Troponin is attached to the protein tropomyosin and lies within the groove between actin filaments in muscle tissue. 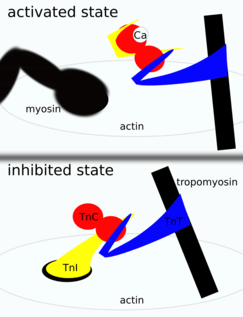 In a relaxed muscle, tropomyosin blocks the attachment site for the myosin crossbridge, thus preventing contraction. When the muscle cell is stimulated to contract by an action potential, calcium channels open in the sarcoplasmic membrane and release calcium into the sarcoplasm. Some of this calcium attaches to troponin which causes it to change shape, exposing binding sites for myosin (active sites) on the actin filaments. Myosin binding to actin forms cross bridges and contraction (cross bridge cycling) of the muscle begins. Troponin activation. Troponin C (red) binds Ca2+, which stabilizes the activated state, where troponin I (yellow) is no longer bound to actin. Troponin T (blue) anchors the complex on tropomyosin. Troponin is found in both skeletal muscle and cardiac muscle, but the specific versions of troponin differ between types of muscle. The main difference is that the TnC subunit of troponin in skeletal muscle has four calcium ion binding sites, whereas in cardiac muscle there are only three. The actual amount of calcium that has been reported to bind to troponin varies from expert to expert and source to source. Both cardiac and skeletal muscles are controlled by changes in the intracellular calcium concentration. When calcium rises, the muscles contract, and when calcium falls, the muscles relax. Research needs to continue to find the link between this two, Substance P and Troponin, where the changes in the intracellular calcium concentration will unlock the key to identify Substance P, you need to observe the events that occur before and after a heart attack to find the puzzle, and finally the treatment for sudden heart attack.